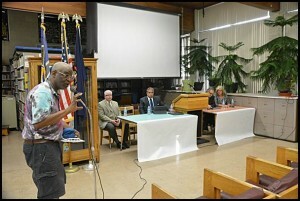 A member of the public speaks at a recent town hall meeting about licensing local medical marijuana operations. City officials are beginning to discuss creating zoning restrictions. A panel of lawyers laid down the city’s options on what to do about medical marijuana dispensaries. The three attorneys, all connected with the city’s law firm, the Allen Brothers, were part of a town hall meeting Tuesday evening at the public library. About 20 people showed up. The attorneys said city officials could continue to do nothing and thus prevent a dispensary from opening, or it could set limits on the number of licenses it allows. In the meantime, state regulators have been criticized for dragging their feet on issuing state licenses. Critics say the background checks are time consuming, and the requirements are too strict. So far the state has issued no licenses. Once the state issues a license, operators who want to locate in Hamtramck have to get approved for a local license. There are five types of licenses, including one for running a dispensary. The others include: Growing, processing, transporting and safety compliance testing. City officials have to decide whether they want to go forward with issuing licenses, and where the growing and sales operations can be located. From the public’s viewpoint, the handful of those who spoke at Tuesday’s meeting appeared to be in favor of allowing medical marijuana to be sold here. One resident questioned why the sales of medical marijuana couldn’t take place in existing pharmacies and thus eliminate the need to figure out where sales can be allowed. The answer: Pharmacies are regulated by the federal government, and the federal government considers marijuana to be illegal. While federal law regarding marijuana says it is as dangerous as heroin, states have been steadily allowing the sales and growing operations of medical marijuana to take place. So far, federal agents have not cracked down on dispensaries operating in states where it is legal, although current US Attorney General Jeffery Sessions has threatened to enforce federal laws. Some 23 states have legalizing the medical use of marijuana, and eight states have legalized the recreational use of marijuana. In Michigan, it appears voters will have a chance to decide on the November election ballot whether to legalize the recreational use of pot. Locally, city officials have dragged their feet on regulating medical marijuana sales here for the last several years. In the meantime, state law regulating medical marijuana has changed. The current city council has not signaled in which direction it will go, other than to be generally in favor of allowing dispensaries to operate. That’s an issue that has bogged down prior city councils. Some have been open to allowing dispensaries to operate in the city’s commercial districts, such as Jos. Campau, Caniff, Conant and Holbrook. Others have argued for stricter zoning rules, limiting marijuana operations to industrial areas of the city – far away from regular retail businesses and residential areas. Currently, some existing dispensaries in the Detroit area have been allowed to operate on a temporary basis while they await state approval. If the state decides to end that temporary status, it could mean that while medical marijuana is technically legal, there would be no place – legally at least – for patients to purchase it. One resident noted that the city should go forward with allowing dispensaries here because they would generate tax revenue. “It’s a great idea – a way to make money, something this community has a problem with,” said Jeanne Serruys. They’s something called residents choice. A ballot question will resolve this question very easily. Hamtramck used to be a city that brazenly flouted prohibition. Too bad we’re not doing that now. Prohibition will end and the places that have already allowed progress will reap the greatest benefits. Look at Colorado. They fully funded their schools with the revenues generated from recreational marijuana. When prohibition ends, our backward state legislature will still be bickering about how to keep it under their thumb and restrict growth. Will our city government be similarly restrictive?